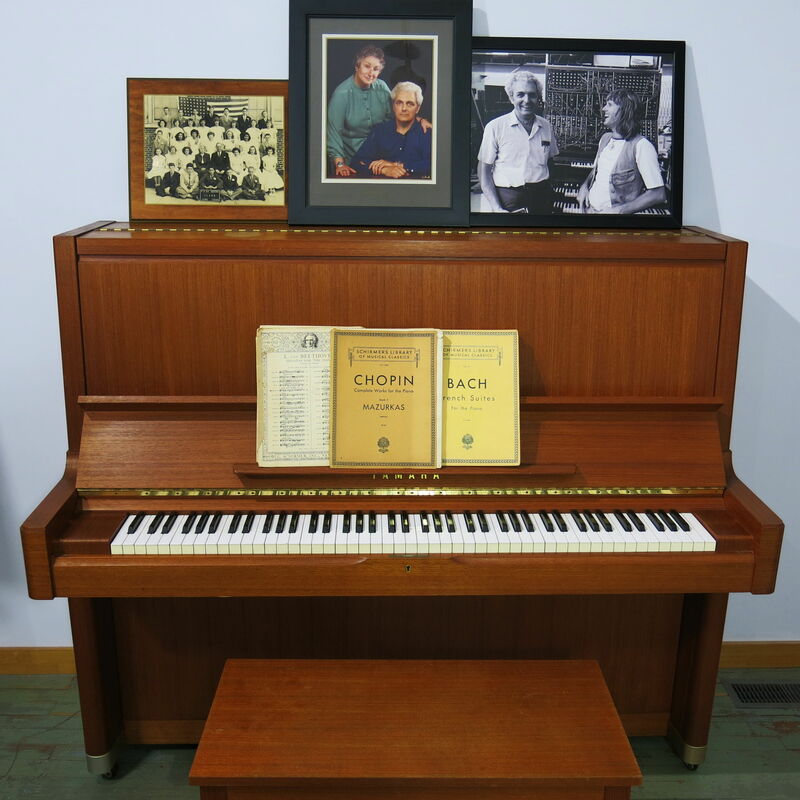 We are thrilled to be sharing an intimate facet of Bob’s personal legacy by inviting local musicians to play his piano, recently installed at the Foundation’s Pop-Up Store at its new location at 56 Broadway Street in downtown Asheville. The piano, an unusual Yamaha teak upright baby grand, has been part of the Moog family since the early 1970s. Local musicians, as well as musicians visiting Asheville, are invited to experience the instrument that was an intrinsic part of the Moog family’s home for decades. Performances will be open to the public as part of “A Song For Bob’s Piano,” which will include musicians from across genres, who will play the instrument in half-hour or one hour segments (see below for schedule). Although Bob is best known for his pioneering work in synthesis, he played the piano from a very young age, even studying at the prestigious Manhattan School of Music. He went on to work as a pianist during the summers in his later teen years, performing at resorts in the Catskill Mountains in upstate New York, and in bands in his college years. The piano provided a deep musical foundation upon which his career was built. The performances offer a tiny glimpse into the unique offerings that will be a part of the Foundation’s Moogseum, opening in late spring 2019. We are honored to share this very special piece of history with the rich musical community that helps make Asheville a creative center. A Song for Bob’s Piano is sponsored by The Piano Emporium in Weaverville, NC. The performances are open to the public and the schedule is as follows. We will be adding names every week, so please check back frequently! The Bob Moog Foundation’s Pop-up store is open Wednesday – Saturday, 11am-4pm through the end of the year.